You may or may not have noticed, but we essentially took last week off to recuperate after a long of May and feel semi-refreshed heading into the NBA Finals. 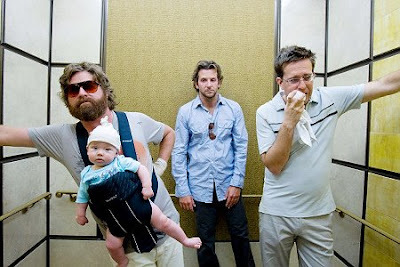 We took in game 1 but found a way to skip out on last night's game 2 because of an all important date with....The Hangover. I'm not going into a bunch of detail or some thorough review because I don't want to ruin anything for anyone. All I'll say is that this movie is a fantastic watch and definitely worth seeing sooner rather than later. Sure, the previews show a ton of funny moments, but there are countless others that will have the fanboys and frat guys quoting for months to come. Plus...the Blaze of Love bachelor party will be happening in the next month or so and we needed some extra preparation.